Few colors grab attention, make a visual statement and bring along with them the aura of luxury and exclusivity like purple. 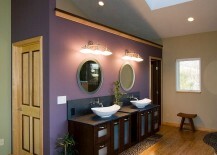 No matter which shade of the color you love, purple has a majestic presence that is simply undeniable. 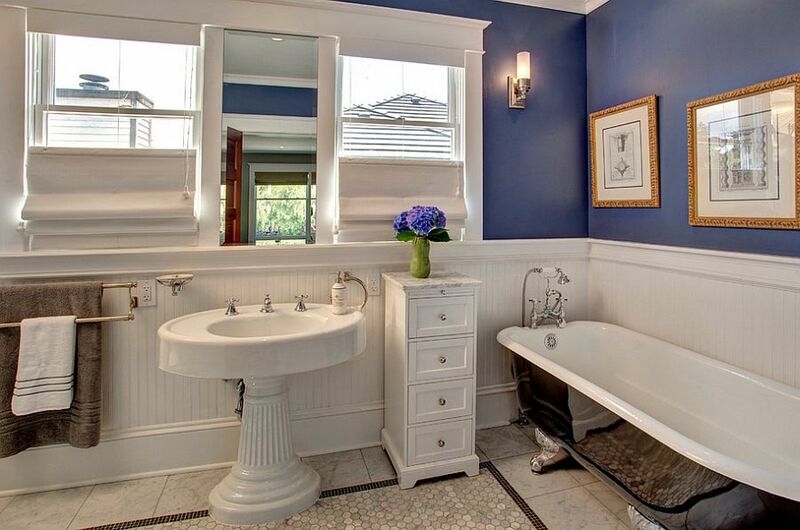 Part of it might be because of the rarity of the color in the ages gone by. 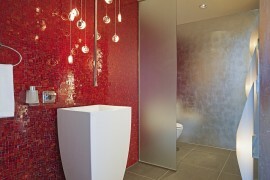 Another reason could be the fact that it is not as easily found in nature as the reds, greens and yellows. 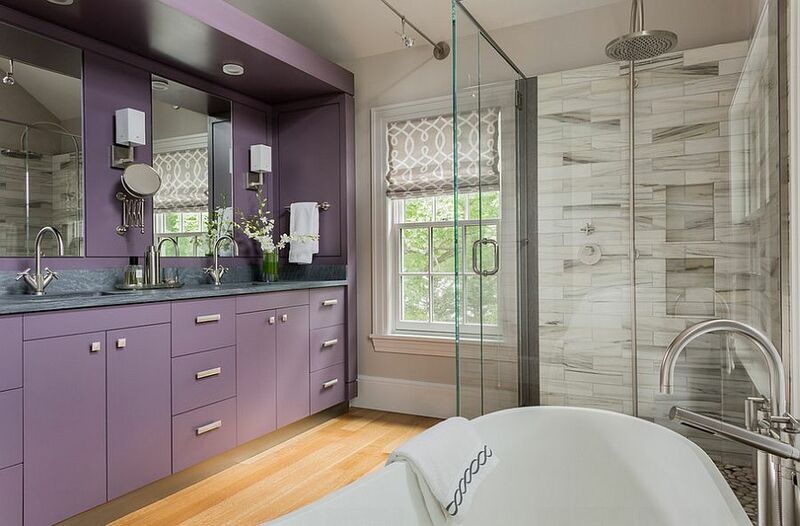 Irrespective of the cause, few colors promise to bring alive an interior like brilliant purple, and today we take a look at how it can be used to give your bathroom a sensational makeover. 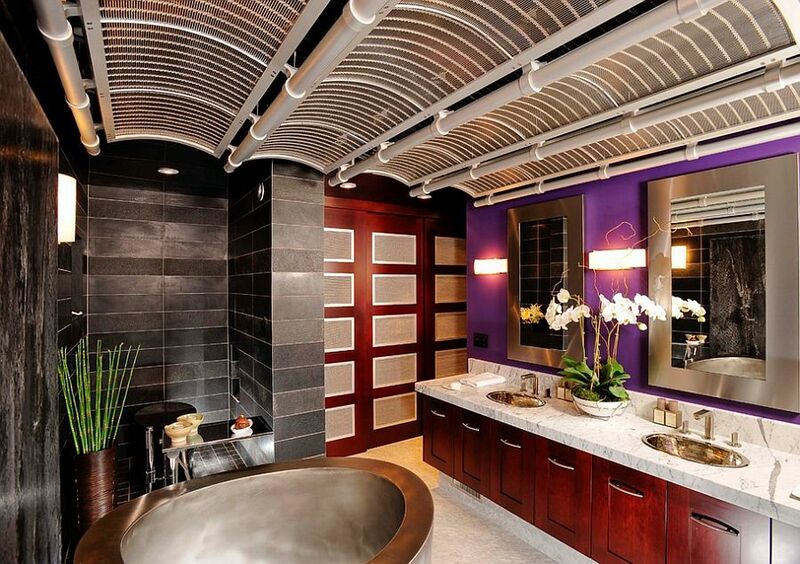 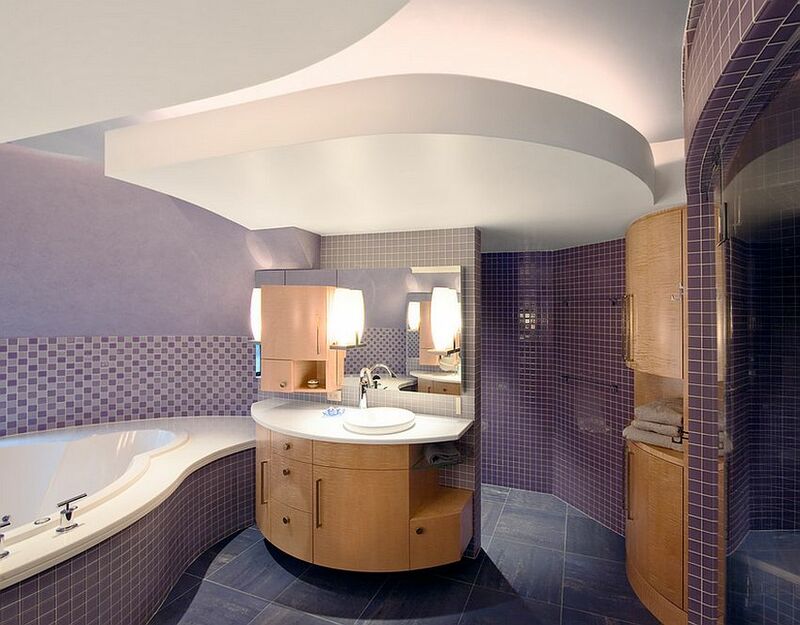 Purple bathrooms might not be as common as their blue counterparts. 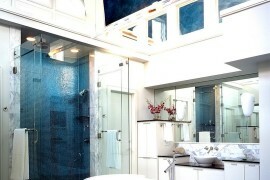 But this is precisely what makes them so special. 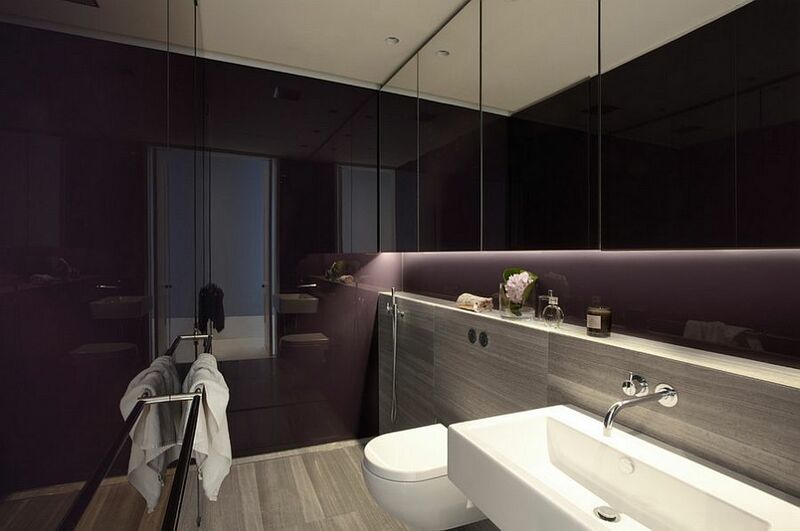 It is a perfect choice if you are trying to achieve that elusive balance between a soothing yet refined bathroom that will melt away all your woes after a long, hard day. 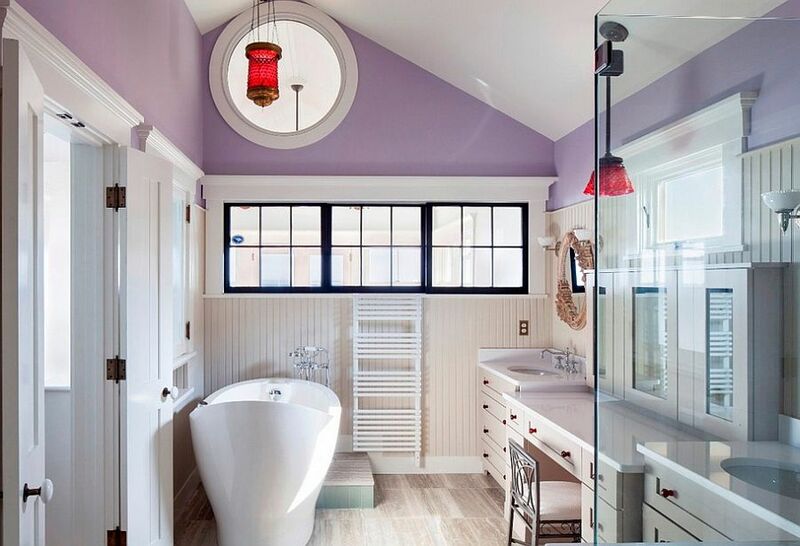 From the quirky and exotic to the sophisticated and urbane, the 23 beautiful purple bathrooms on display today should inspire you to go down this radiant route as well! 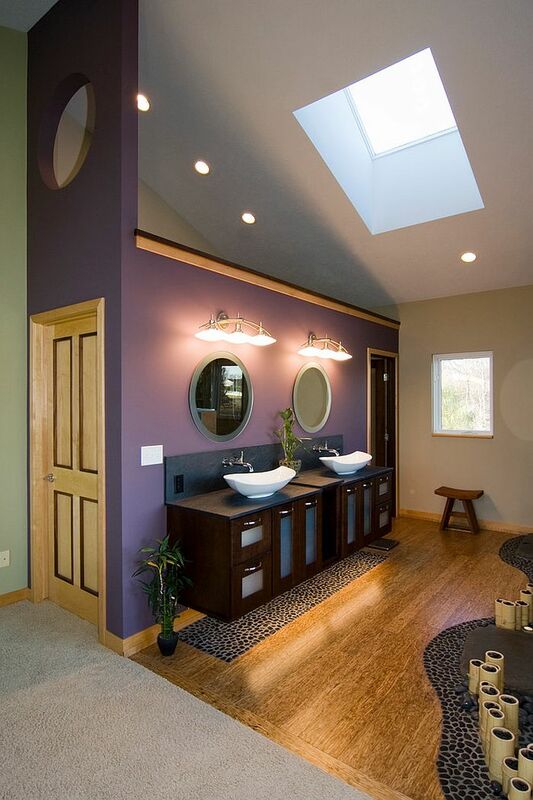 The many shades of purple make it a versatile background color in the bathroom that can be used either to accentuate specific architectural features, or to paint a relaxing backdrop. 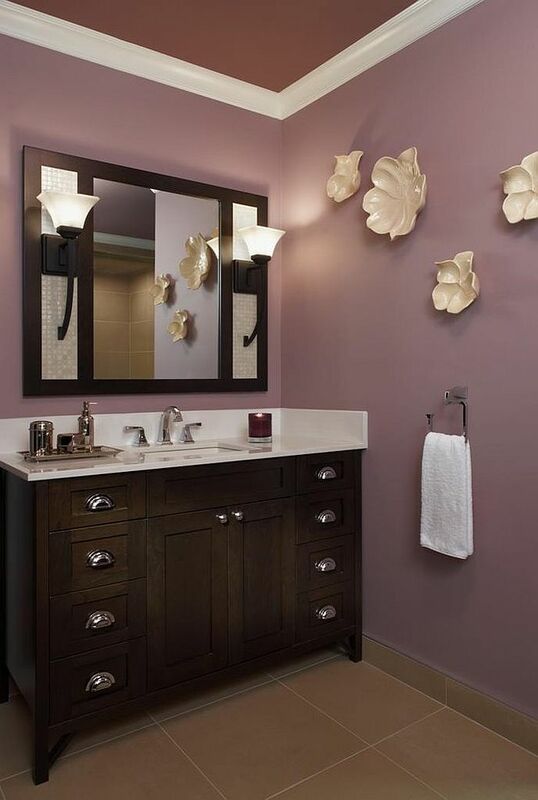 It is best to use a lighter shade of purple with a matte finish in case you are planning to drape the bathroom wall in plenty of purple. 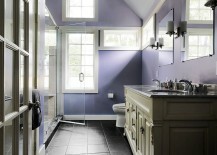 Bright purple hues with a glossy finish look best when used in a restrained fashion. 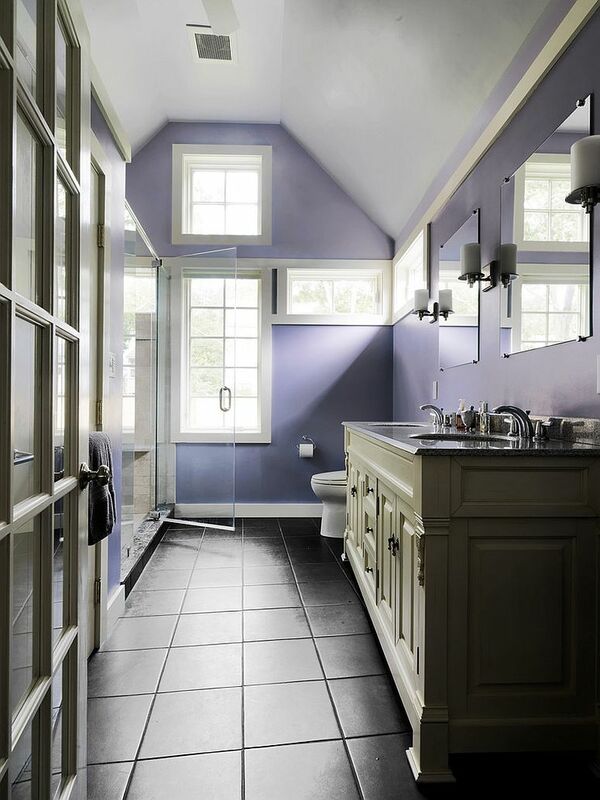 Do not be too hesitant to use purple in a small bathroom either, as it can give the space an air of cheerfulness and elegance that will eliminate any sense of claustrophobia. 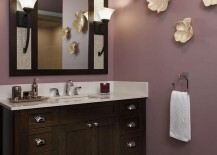 Make sure, though, that the bathroom is as organized as possible, and avoid any other bright colors. 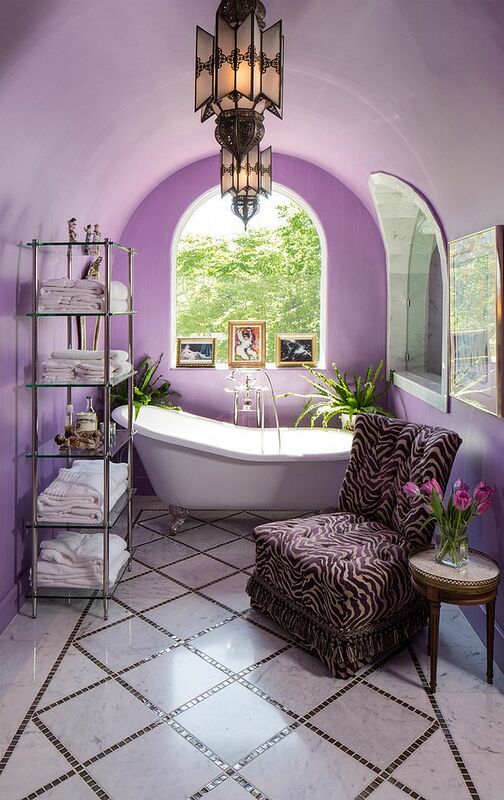 Purple is a perfect color for bathrooms with exotic themes such as Moroccan, Mediterranean, Asian and Victorian, and it almost seems to add another layer of intrigue and lavishness to such settings. 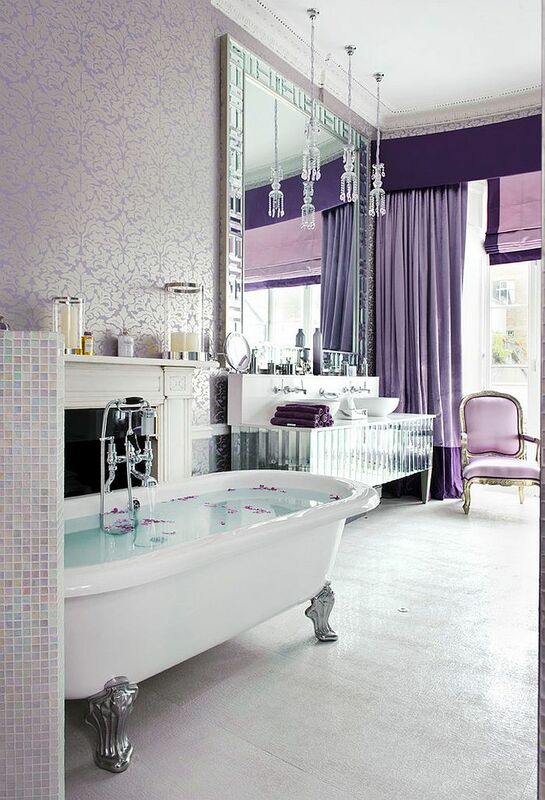 Hollywood Regency is another style that benefits from the glitz, glam and exuberance of purple at its dazzling best. 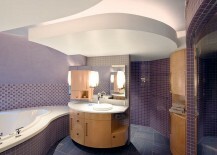 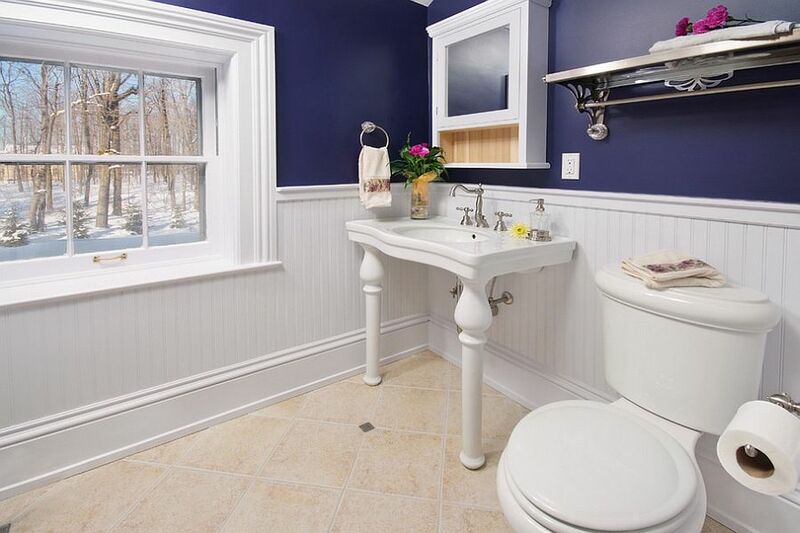 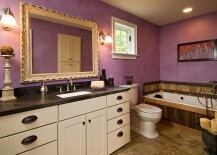 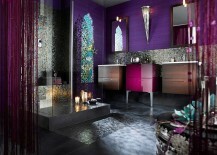 While purple is often associated with feminine designs, it works well in gender-neutral bathrooms as well. 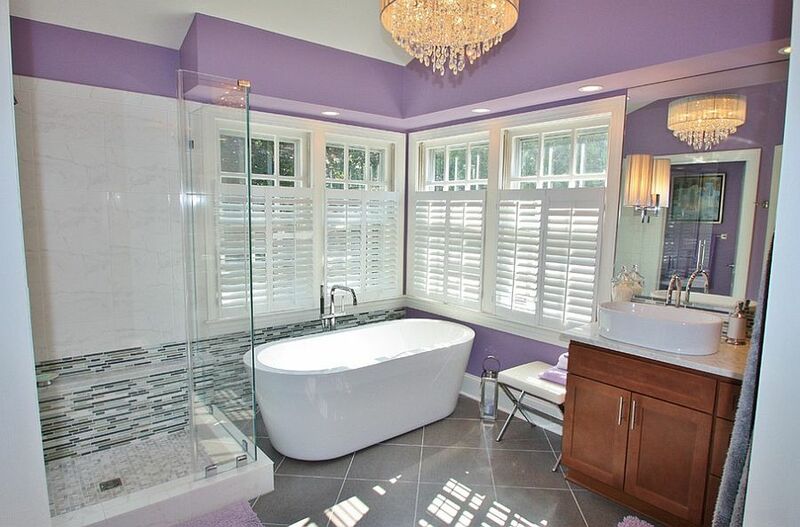 Instead of drenching your bathroom in purple, maybe you prefer a less audacious yet equally exciting approach. 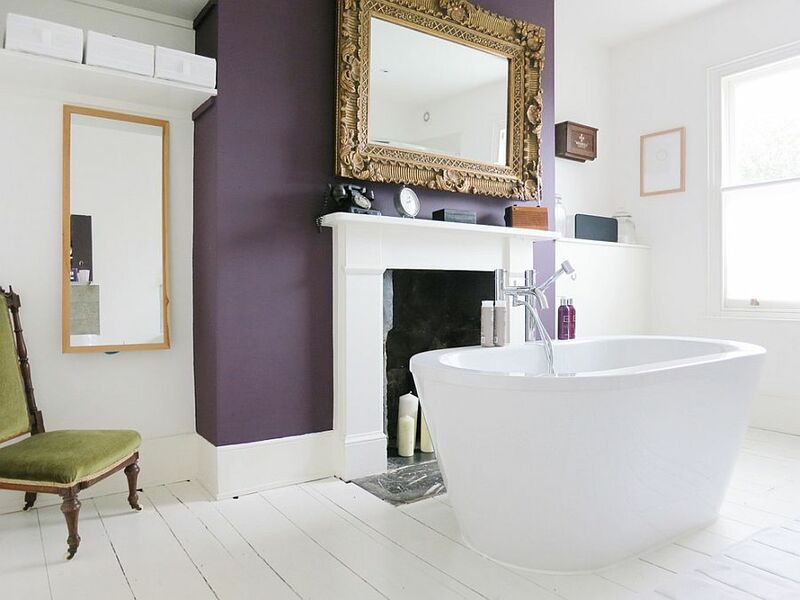 Combining purple with white might sound like a traditional idea, but it is a classic for a very good reason – it never fails! 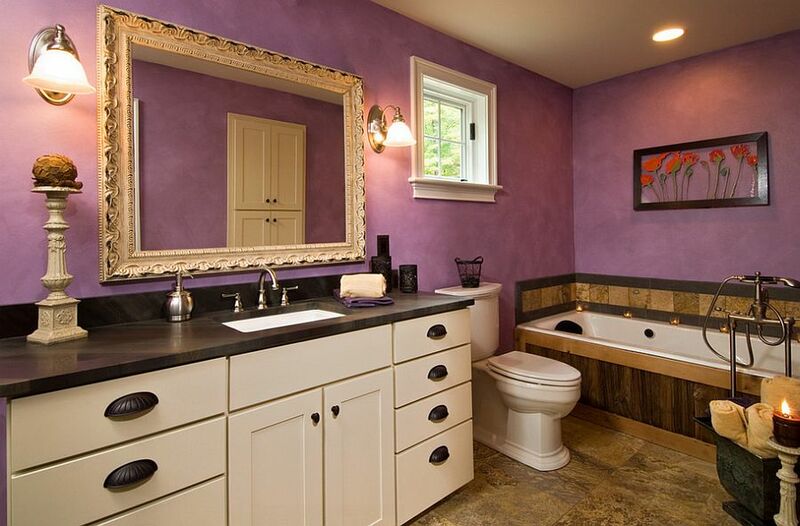 Think of dividing the bathroom into two halves with purple and white taking over each one. 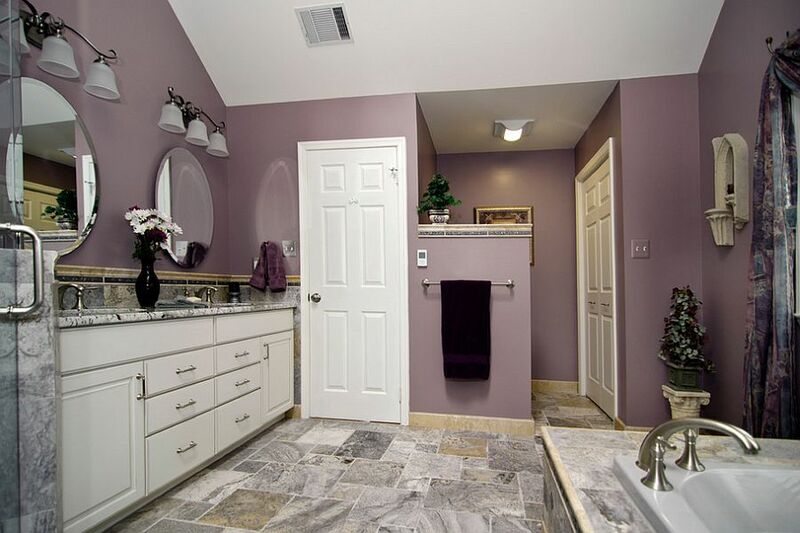 Of course, these need not always be equal, and you can use purple in a far less prominent fashion to see how it goes before committing to the color fully. 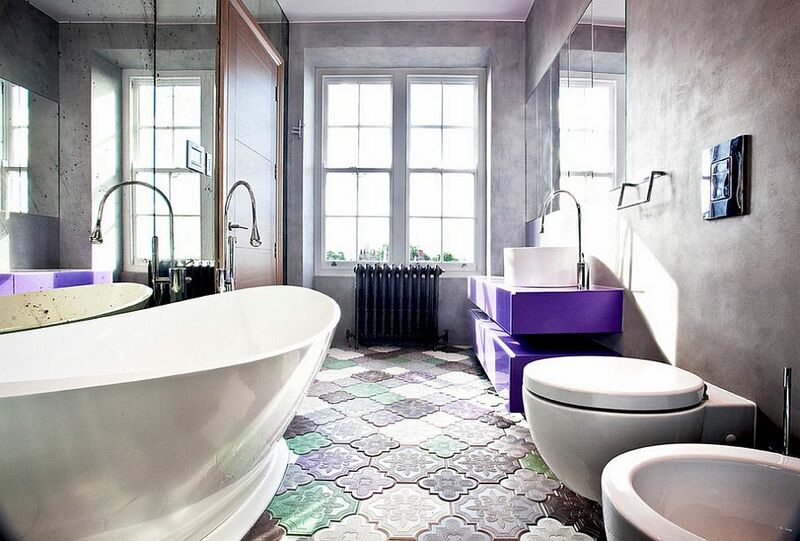 An accent mauve wall or even new shower tiles in aubergine will get you started on the path towards purple nirvana! 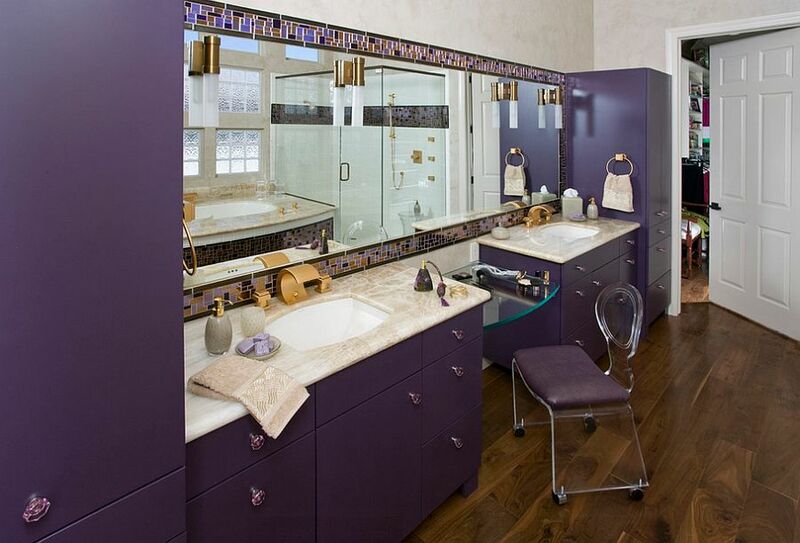 A ravishing vanity in purple allows you to instantly add color and elegance to an otherwise mundane, neutral bathroom with ease. 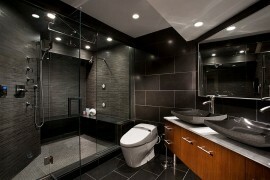 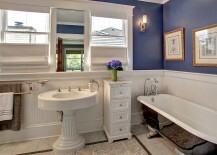 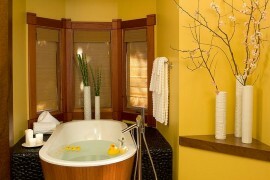 Do not confine yourself to tiles and paint alone when it comes to adding color to the bathroom. 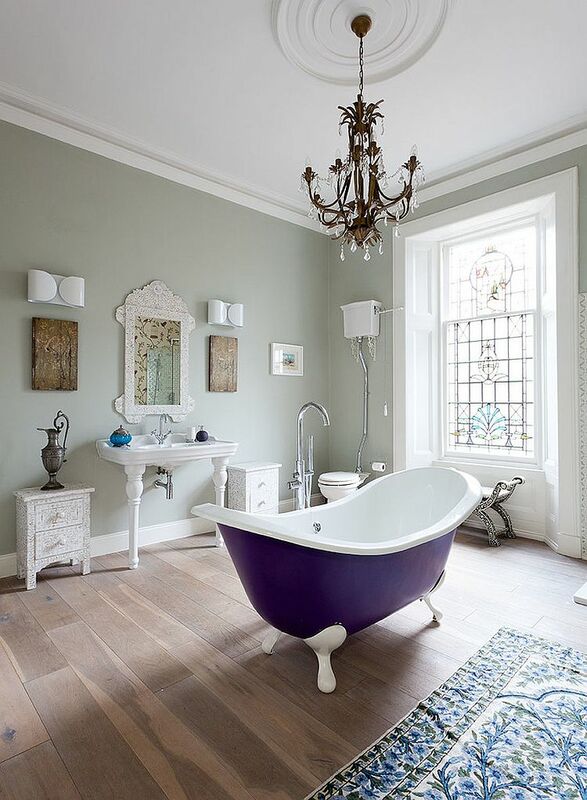 If a new purple vanity seems too much, think of a standalone or even trendy claw-foot bathtub in beaming lilac to give the bathroom its purple focal point! 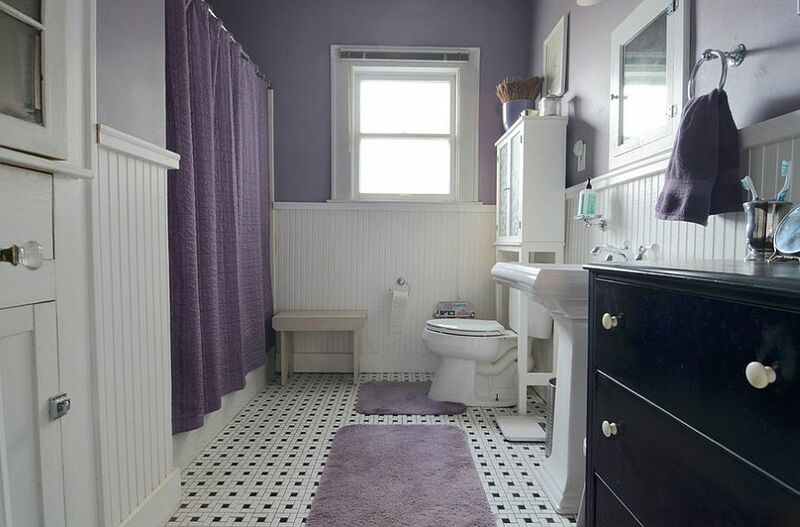 A spa-style, traditional bathroom can also benefit from both purple accents drapes and wallpaper, which can be switched out with ease once you are bored with the look. 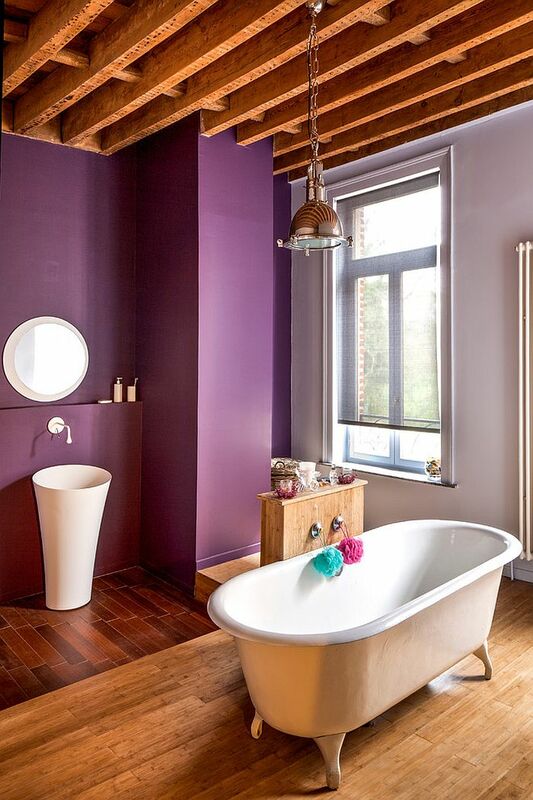 So, are you ready to take a plunge into purple?